Create a standout look in every room of your home when you shop with us for laminate flooring in Tampa, FL. At our local showroom, we carry a wide selection of laminate tile flooring in styles that meet any taste. Our collection is available in bold looks that value pricing and durability. With products, you will be able to expand your decorating ideas without sacrificing quality or overspending. Stop in today to upgrade your home to a more modern look. Enjoy the benefits of laminate wood flooring, which include the high-end look of hardwood at half of the cost. 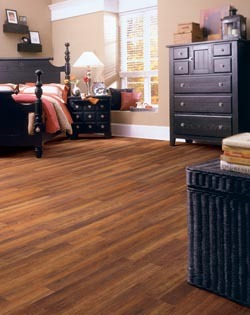 This versatile flooring lasts long and adds elegance to any room with little to no maintenance. These floors add the aesthetic appeal of a classic, colonial home while combining the modern convenience of simple maintenance for the homeowner. Choose wall-to-wall charm, with easy installation. Do you have an idea of how you want your new laminate flooring to look? Whether you already have a design goal in mind or you need a little extra inspiration, our sales team is here to help you. We offer in-depth solutions to fit each of your taste preferences. During your visit to our showroom, we are happy to speak with you about the features and benefits of every product that we carry. Our sales team works hard to provide you with the right solutions to fit all of your flooring needs. Transform the look of your home and impress every houseguest with stylish and durable laminate flooring from our locally owned store. Our team of elite flooring installers gives you the chance to create a stunning and functional living space for your family and friends. We take care of all of the details so you can relax and enjoy your new laminate flooring without the hassle of constant maintenance and repairs. Whether you desire the look of traditional wooden floors or the one-of-a-kind patterns that tile brings to a room, our professionals sell and install a vast selection of laminate wood flooring and laminate tile flooring options that are sure to enhance the atmosphere of every room. Laminate flooring offers a stunning visual appeal to every room, as well as a level of quality and durability that is unparalleled. Our laminate floors are available in a vast assortment of beautiful finishes that matches the style and decor of any home. When you shop with us, you will enjoy access to a full selection of products from some of the leading brands in the industry today, including Floorcraft. Furthermore, laminate allows you the freedom to replace individual pieces without tearing up the whole floor. It also has a smooth texture with no grooves or grout, making it easy to clean, mop, and sweep over its slick surface. It even resists dirt and stains for a simple way to keep your home looking beautiful at all times. With everything you have to do during the day, caring for your flooring should not be on your list of priorities. For flooring that requires little maintenance, turn to us for our selection of laminate. Laminate flooring offers a beautiful style that holds up to regular use. At our showroom, you will find everything from laminate tile flooring to laminate wood. No matter what your personal tastes are, we have the perfect product in stock to bring your ideas to life. Our inventory includes a wide range of different options. Laminate wood floors are made from compacted wood, giving them the extra resistance they need to repel the scuffs and scratches that occur over time. Additionally, the protective laminate coating prevents moisture from slipping under the floorboards, which saves you money in the long run as you won’t need to endure repair or replacement costs. When you wish to update your home to a sleek, contemporary design, look no further than our laminate tile flooring. These floors are made of some of the most durable and versatile materials in the industry, ensuring you receive a floor surface that stands the test of time. Laminate tile does not crack or break over the years, and it stays in pristine condition even after you drop something heavy on the surface. Once you choose the perfect set of laminate flooring for your space, trust our experienced contractors with the rest of your project. For your convenience, we offer laminate flooring installation services for every product that we carry. With a professional installation, your job will be performed the right way the first time. We focus on the details to deliver a top quality result for jobs of any size and complexity. By working with us, you will ensure that your new floor is installed quickly and correctly, making it look better and last longer. In the event of a crack or other issue, laminate allows you the freedom to replace individual pieces without tearing up the whole floor. It also has a smooth texture with no grooves or grout, making it easy to clean, mop, and sweep over its slick surface. Laminate also resists dirt and stains, offering homeowners a simple way to keep their spaces looking beautiful at all times. No matter how large or small your rooms are, you can count on us to take care of every detail of your new installation. Our laminate flooring installation team is specially trained to handle every single laminate product we sell in our store. We offer endless options to help you modernize your home. Whether you have chosen laminate wood or tile, our experienced crew of technicians installs your flooring as quickly and efficiently as possible. We pride ourselves on using the latest technology and equipment available to ensure a beautiful finish. Along with our Confidence Plus Warranty, you are sure to feel great about every aspect of your new, gleaming floors. Contact us to shop our selection of laminate flooring for every room in a home. We feature laminate tile flooring and laminate wood in endless styles for customers throughout Brandon, Carrollwood, Lutz, Ybor City, and Tampa, Florida.